Fuzi is a people person. All through her life, she sees only the ways to connect with people, even when the people she met were not friendly at first. She will think of ways how to blend in. When she started working in the building industry, dealing with cement and steel bars, the Chinese towkays from the hardware shops did not take her seriously. When she went to visit them, they were in awe - "Wah, you malai mui ah?" (Wow, you are a Malay girl?) they exclaimed. “As though they think a malai mui should not be in the building industry, worse off, doing sales,” Fuzi recalled. That was in the 70s. Taking the bull by its horn, Fuzi took their comments as a joke or a passing remark. “You can’t take life so seriously, anyway,” Fuzi chuckled. “So, I was as jovial as them. 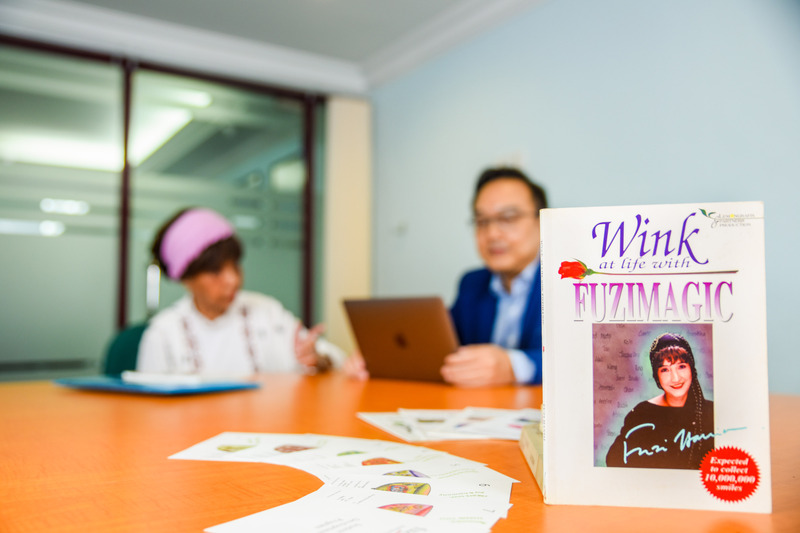 Instead of talking about our products, which were cement and steel bars, we joked about their short fling in Hatyai and football - a subject which I knew nothing about.” Fuzi revealed her secret how she communicated and connected with people even on a subject she hardly knew. “I recorded the world cup while I slept. In the morning, I watched a little. Then, when I met with the Chinese towkays, I shared with them the excitement. So, they thought I stayed up and watched football.” Fuzi laughed. With her ingenuity in the ways she connected with people, in due course, she built bridges of goodwill. She is a people’s magnate. She likes to be with people and people like to be with her. Deep inside her, however, she felt she was an alien in an industry dominated by men. Someone from another planet with an extra big heart. She felt that she came to Earth to inspire harmony. Fate always has a way to get you started on your soul’s journey. The ‘alien’ affinity got Fuzi to pen her thoughts and created two cartoon characters, Willa and Wizz. In her comic book, Aliens from Glolan who are called Glolites, were sent to Earth to build bridges and connect people through the awareness of love and respect. Fuzi was flabbergasted. When you wink at life, life becomes easy, things will happen as natural as sunrise and sunset. We don’t have to be desperate, despair or give up when things don’t turn up the way we desire. Just change the ways you look at things, and the way you work will change too. “In the 97-99 Asian financial crisis, a lot of companies in Malaysia were badly hit. My joint venture business with a building material conglomerate went so bad, everything turned red. My business was in such a bad shape, people owed us money and we owed others as well. Instead of nosediving into self-destruction, I rose above the water and I breathed. I told myself not to cry. I reminded myself to wink at life.” Fuzi brought a light of hope even when she was talking about the bad times. 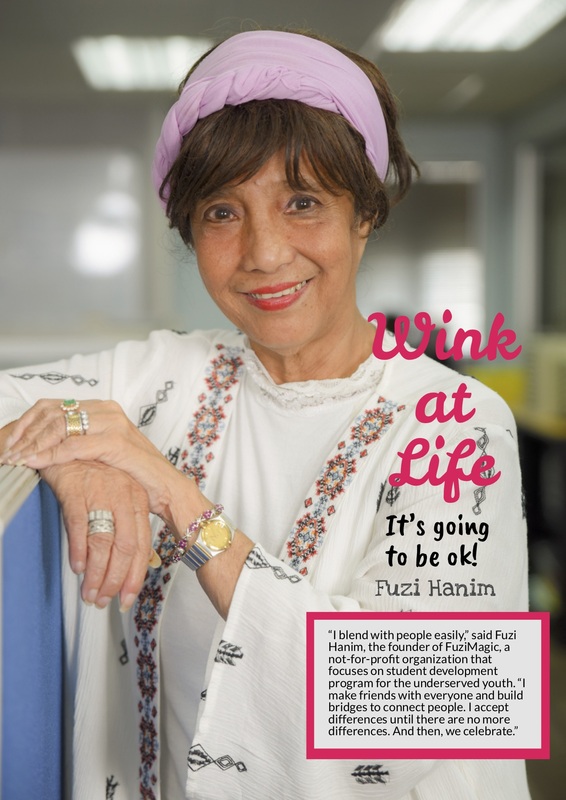 “Wink at life means whatever comes your way, just know that everything is going to be ok. My doa softened everything.” Fuzi felt the light at the end of the tunnel. “And then, a silver lining appeared out of nowhere. A newspaper interview which came at the right time introduced me as a woman working in the male-dominant building industry. The article created unprecedented magical events. People began to hear of me and more help was extended to me when I thought I was thrown into despair.” Fuzi winked. The joint venture business turned around and Fuzi sold the business eventually. Now, she focused her time in building FuziMagic, a not-for-profit student development organization. The spirit of perseverance in business also gave Fuzi the strength to continue to help the underserved youth. She and her team at FuziMagic has since organised several leadership, communication and even cooking classes for the underserved children and youth sponsored by people who just turned up when the time was right. With the love of building a bridge of goodwill and believing that FuziMagic can help to fulfil the children’s dreams, Fuzi was somehow linked to many supporting individuals. This support has helped FuziMagic to realise their objective of nurturing underserved children with many interactive student development programs. Even before FuziMagic was officially incepted in 2014, FuziMagic has already received benevolent support from many individuals and corporations. Fuzi’s secret to bringing ideas to fruition: “I believe in prayers. I have my secret doa, I believe that whatever we need, we will be given.” Now, beaming with confidence and a big heart filled with love, Fuzi with the team from FuziMagic are going to soar with more student development programs for the underserved youth. For sponsorship and contribution, please check out FuziMagic. Download full-color 4-page article here. Read related article here - Grace Covenant, JB. Knowledge is power because it is certain, and certainty is strength.